The rook is a valuable piece. Its value on the board is bigger than that of the pawn, the bishop and the knight but smaller than that of the queen. 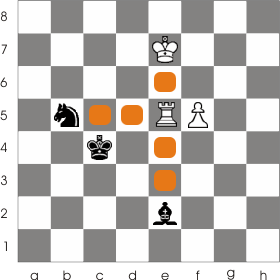 At the beginning of the game the rooks are placed in the corners of the board just like in the following image. The rook can move along the ranks and files of the chess board as long as it doesn't bump over a piece. 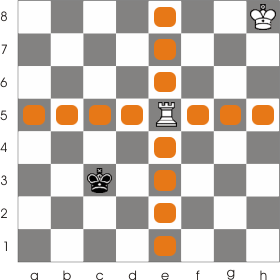 The white rook can move anywhere on the orange squares. 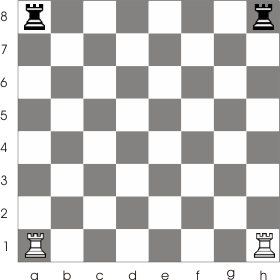 In the example bellow the rook can only move on the highlighted squares, because it is blocked by a few pieces (but notice that White is able to move the rook to e2 or b5 by capturing the black pieces on those squares ). The rook can capture any enemy piece that is on a square that the rook can move on. In the example above the white rook can capture the bishop at e2, but can't go pass it on the same move. The rook can also do a special move called castling which involves moving the king and the rook at the same time, but we'll talk about that later at castling .